DECEMBER, 2016 – While things are getting chilly in the Bay Area this winter, the Sales Enablement space is only getting hotter. 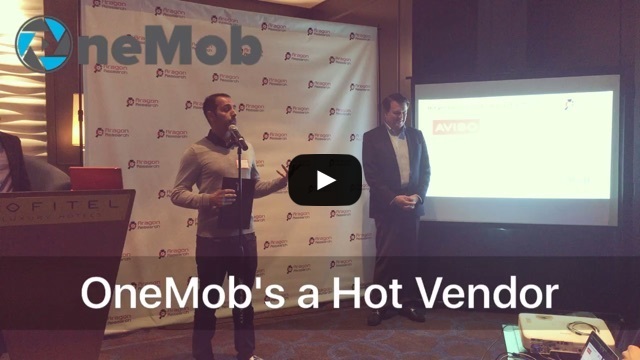 That’s because OneMob was named a Hot Vendor in 2015 by Aragon Research. The technology research and advisory firm held their annual award ceremony earlier this month in Palo Alto, California, where they named the best Sales Enablement vendors who are helping sales organizations sell more effectively and predictably through innovative and cutting edge technology. OneMob was recognized at the event as one of the winners, where CEO Sati Hillyer accepted the award on the behalf of the OneMob team. A huge thank you to Aragon Research for this award! To learn more about how OneMob helps companies like Cisco, Yelp and LinkedIn utilize video messaging in their sales outreach and customer engagement, contact us and get started with a free trial.